Online registration has closed. Tickets may be purchased with cash, check or credit card at the Hudson Chamber office (502 2nd Street): Friday, November 17 from 8:30am-4:30pm, Saturday, November 18 from 8:30am-5pm, and Sunday, November 19 from 11:30am-4pm. Tickets can also be purchased with cash or check only at the Hudson House Grand Hotel, 1616 Crest View Drive, on Saturday, November 18 from 8:30am-5pm, and Sunday, November 19 from 11:30am-4pm. There will be a ticket sales table in the lobby. The annual Christmas Tour features four privately owned homes and the first floor of the historic Octagon House, all decorated in their Christmas finery. Click here for a description of the homes featured on this years Tour. ​Visit our four homes during the evening hours when each home sparkles and glows! Transportation is NOT included. You may use your ticket on Saturday or Sunday to tour the first floor of the Octagon House. Ticket Prices: Early discount tickets are $21 if purchased by November 10. After November 10 tickets are $23. $21 (Pre-Sale Discount will apply at check out) / $23 after Nov 11. This popular, daytime tour features four homes and the first floor of the historic Octagon House decorated OVER-THE-TOP for the holiday season. The Traditional Tour includes the convenience of a free shuttle service with stops to dine and shop along the way. A map is provided with each ticket. Shuttle transportation is included or you may drive yourself. Must be 12 or older to attend. Make sure you wear socks as you will need to remove your shoes at each of the homes (break out your favorite holiday socks!). 2 Floors of vendors & crafters. 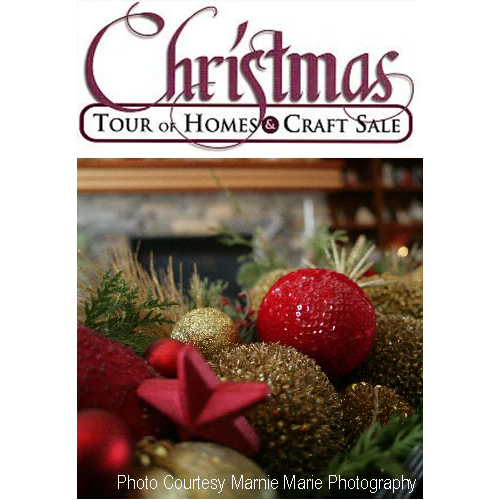 Find the perfect item for your home or gift for a friend at the Craft Sale & Marketplace held in conjunction with the Christmas Tour of Homes! Explore the crafter booths on the ground floor and the marketplace vendors on the second level of the Hudson House Grand Hotel. Jewelry, apparel, ornaments, household goods, and gourmet foods are among the most popular items. ​Slip away with the girls for the weekend to shop, dine, relax and attend the Christmas Tour of Homes! Click here for more details. Interested in having your home on the Tour? Please fill out the interest form by CLICKING HERE. Download the Homeowner Informational Sheet. If you have additional questions please call our office (M-F 8:30am-4:30pm) at 715.386.8411.